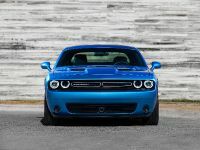 Mopar Underground introduces Dodge Challenger Blacktop, Dodge Challenger Targa, Dodge Ram TRXtreme, Dodge Ram R/T, Dodge Ram Sportsman and Dodge Ram Mopar Street Package. 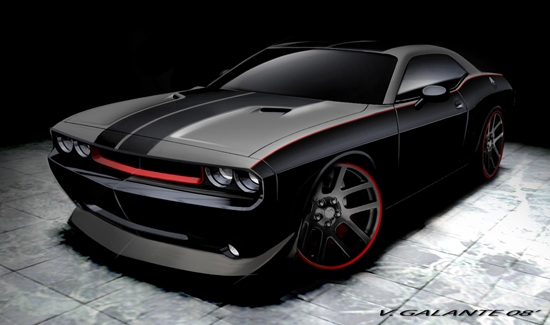 A menacing creation from the minds of the Mopar Underground design team. 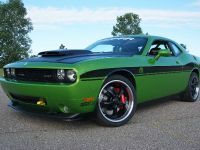 The Dodge Challenger Blacktop began life as a 2009 Dodge Challenger R/T equipped with a 5.7-liter HEMI® V-8 and six-speed manual transmission. 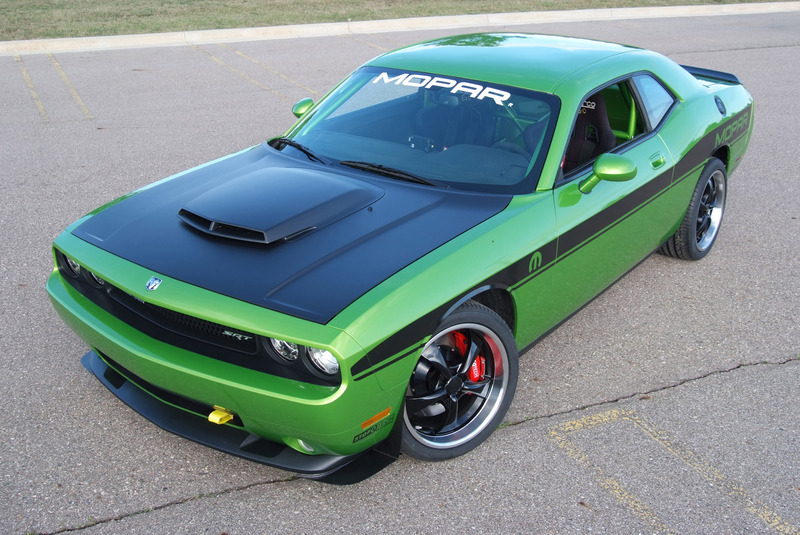 Mopar Underground added custom-made spoilers and front brow. 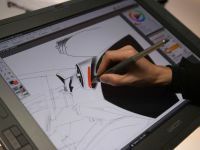 To finish off the look, a black-on-black racing stripe paint scheme was added. 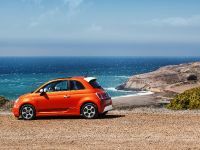 The "in the weeds" stance and superb handling characteristics are accomplished by the Mopar coil-over suspension and strut tower brace. Blacktop rolls on massive 22-inch Dodge Viper wheels from Factory Reproductions wrapped in Dunlop tires measuring 265/35 R22 front and 305/30 R22 rear. 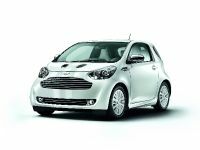 To ensure the powertrain can keep up with the suspension, underhood performance is enhanced. 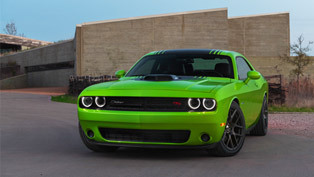 The addition of Mopar components, including a cat back dual-exhaust, cold air intake, allow the HEMI V-8 to breathe easy. The interior has been enhanced with Katzkin leather seating finished in bright red plus a Mopar Kicker audio system for premium sound. 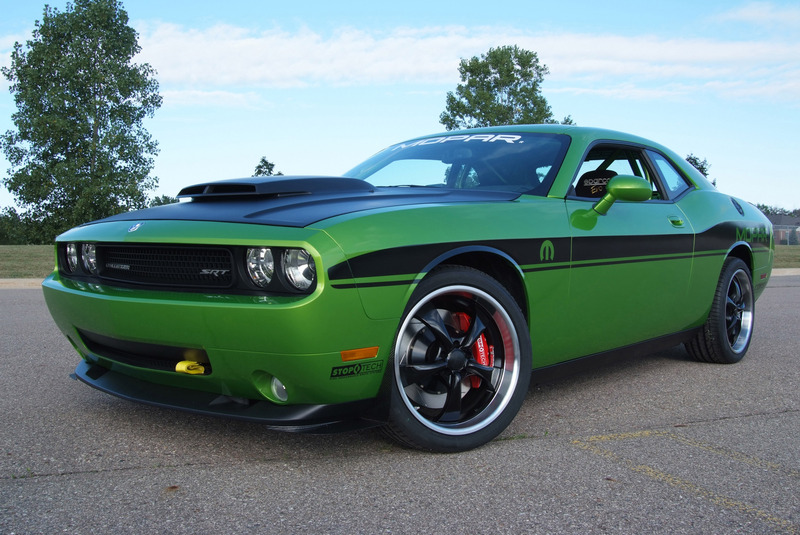 The Dodge Challenger Targa is a full-blown competition car that raced and completed the infamous Targa Newfoundland race this year. 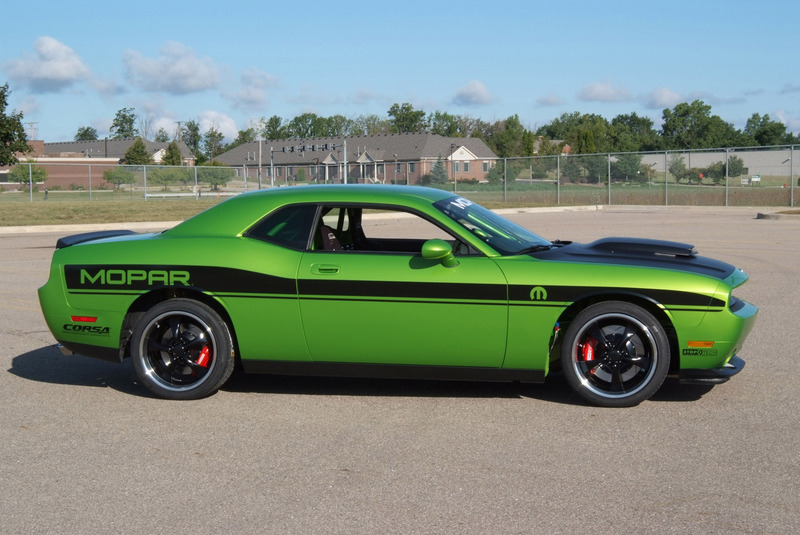 "Samantha" started life as a Mopar Challenger drag race package car. Many features were borrowed from the Dodge Viper, but the most noticeable is the snakeskin green paint. 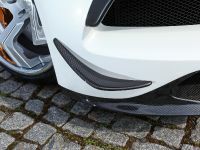 To keep the front end down, a Mopar chin spoiler "Splats" developed in a full scale wind tunnel, was added to the front of the car. Mopar gauges keep a close eye on the vital signs. 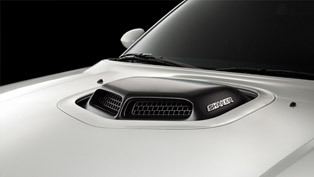 The Mopar hood is equipped with a scoop to make room for the 540-horsepower, 490 lb. ft. of torque, 392 HEMI® V-8 Mopar crate motor. 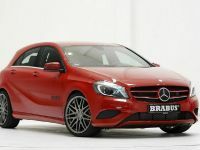 Mated to a Tremec six-speed manual gearbox, the engine blasts power to the rear wheels through a production 2009 modified gear ratio in the rear end. 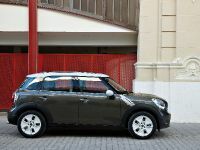 An abundance of fade resistant stopping power comes from Stop-Tech brakes. 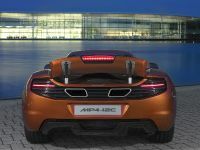 Up front, the six-piston calipers clamp 380-millimetre rotors, while in the rear, four-pot calipers work with 355-mm rotors. Developed by KW, the race suspension and brake upgrades came from a proven hero — the Dodge Viper ACR, which just broke the production car lap record at the world-renown Nurburgring in Germany. 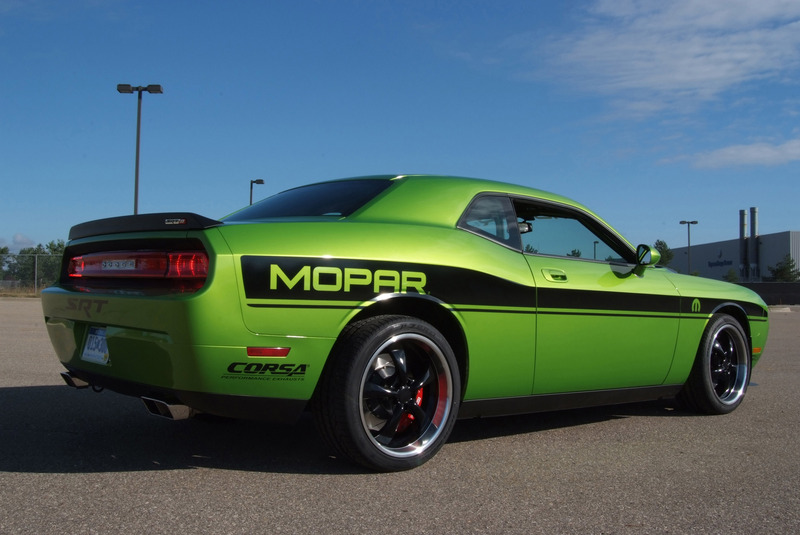 With only a few exceptions, the Dodge Challenger Targa was built using parts available through Mopar. 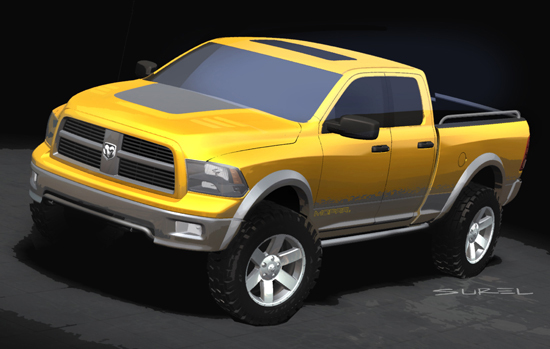 The Dodge Ram R/T starts off with a 2009 Ram Sport with a 380-horsepower, 5.7-liter HEMI® V-8, a 4.10 gear and a high stall converter, which rockets the truck to impressive times. 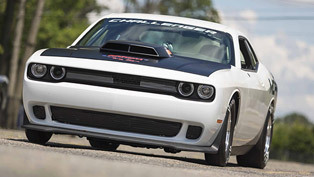 With this blank canvas, Mopar Underground created a Dodge Challenger-inspired version of the Dodge Ram. 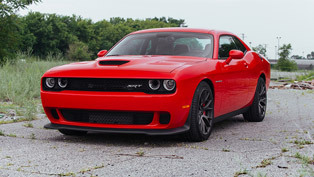 On the performance side, a Mopar cold-air intake kit to keep the engine breathing and a Mopar dual exhaust system with a performance rumble. 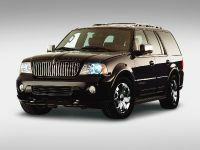 The exterior is painted classic B5 blue with a Mopar dual-snorkel aluminum hood and carbon fiber accent stripes. Dropped chassis is possible with a concept Mopar air suspension kit. The look is made more evident by the body kit, consisting of sill and box pieces, finished up with a chin spoiler. 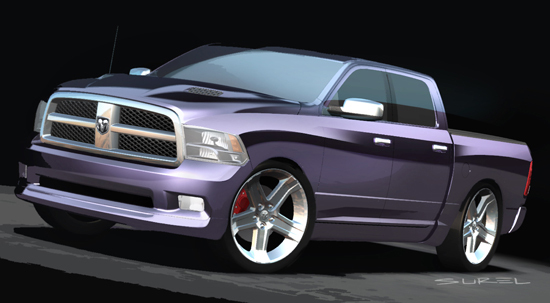 For wheels, concept Mopar 22-inch Alcoas wrapped in 285/45R22s in front and 305/40R22s in the rear. A Mopar hard tonneau cover and a unique integrated spoiler are combined with the Mopar bed mat showing an ambient under-rail LED lighting system. 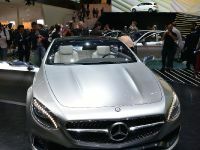 The interior features Katzkin leather seats with body color stitching to match the instrument panel and steering wheel. A set of Mopar Pedals are installed, adding to the performance look and capability. The most noticeable aspect of the 2009 Dodge Ram Sportsman is the unique blowing-leaves paint scheme inspired by a new interpretation of traditional camouflage designed by Mopar Underground. 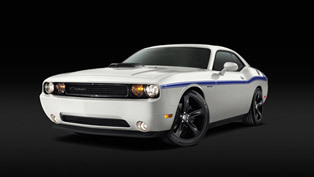 The paint is protected by a set of accent Mopar wheel flares and running boards with an integrated step. 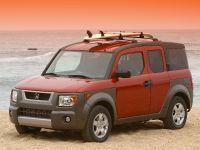 The Sportsman features Dodge's exclusive RamBox storage system, filled with plenty of outdoor gear, and the bed rail system holds a cargo rack for additional cargo capacity. The Mopar telescoping trailer tow mirrors aid in rear visibility and match the color theme. The vehicle gets the right stance and added capability with a Mopar two-inch lift kit supported by Mopar polished and forged 20-inch wheels with 33-inch tires. You'll never get lost with the Mopar navigation unit, but if you do you will be able to enjoy SIRIUS® Satellite TV or movies on the Mopar headrest DVD system. Sit back and relax in the perforated leather Mopar seats by Katzkin, embroidered with the Sportsman logo. The steering wheel and door pulls have been trimmed to match, and the Mopar ambient lighting system gives a unique glow to the interior.